En son Margotbean en 2019-03-24 20:17:01 tarihinde düzenlenmiştir. Sebastian is a villager who lives in in The Mountains north of Pelican Town. He's one of the twelve characters available to marry. Sebastian lives in the basement of his mother Robin's carpenter shop, north of town. On the 4th of Summer, he has an appointment at the clinic. 9:00 AM In his bed. 10:30 AM Gets out of bed and moves to his computer. 3:00 PM Leaves his computer and goes to the kitchen. 3:40 PM Leaves the kitchen to go back to his room. 4:10 PM On his computer. 6:30 PM Leaves home and walks to lake next to his house to smoke. 7:30 PM Smoking by the lake next to his house. 9:30 PM Goes back to his house. 10:00 AM Gets out of bed and moves to his computer. 12:00 PM In his room, standing by couch. 5:30 PM Leaving his room to go to the kitchen. 6:30 PM On his computer. 9:30 PM Goes to bed. 2:00 PM Leaving home to go smoke by train station. 3:00 PM Smoking by the train station. 6:20 PM Standing east of train station, by tunnel. 8:10 PM Standing west of train station, by tunnel. 3:00 PM Leaves his room to go play pool with Sam at the Saloon. 5:20 PM In the Saloon, playing pool with Sam. 9:00 AM Leaves house to go to Sam's house. 11:30 AM In front of Haley and Emily's house with Sam. 12:30 PM Follows Sam to his room. 1:00 PM In Sam's room. 6:00 PM Leaves Sam's house with Sam and goes to the river. 6:20 PM Smoking by the river outside Sam's house with him. 7:30 PM Going home from in front of Sam's house. 10:30 AM Gets out of bed and leaves house to go to the beach. 1:30 PM Standing at the end of long pier to the left of the fish shop. 5:00 PM Leaves the pier to go home. 7:40 PM Arrives home and goes to bed. 3:00 PM Leaving house to go to the Saloon. 5:20 PM At the Saloon, standing by red sofa in arcade. 3:00 PM Arrives at the Railroad crossing sign. 6:00 PM Moves to the east Railroad tunnel. 7:30 PM Moves to the west Railroad tunnel. 9:30 PM Leaves for home. 9:00 AM In his room, by bookcase. 10:00 AM Leaving house to go to the clinic. 11:50 AM In the the clinic's waiting room. 1:40 PM In the the clinic's examination room. 6:00 PM Arrives at his room and goes to bed. 6:00 PM Leaves Sam's house and goes to the river with Sam. 6:20 PM Smoking by the river outside Sam's house with Sam. 1:30 PM Standing at the end of long pier to the left of fish shop. 5:20 PM At the Stardrop Saloon, standing by red sofa in arcade. 12:00 PM Leaves home and walks to lake next to his house. Doesn't return home until after 2:00 AM. 5:10 PM Leaving his room to go to the kitchen. 6:00 PM Leaves the kitchen to go back to his room. 5:20 PM In the Stardrop Saloon, playing pool with Sam. 12:30 PM Follows Sam to Sam's room. 12:00 PM Leaves home and walks to lake next to his house. 1:00 PM Standing by the lake next to his house. 10:30 PM Arrives at his old spot by the mountain lake. 12:30 PM (approx.) Leaves to go visit Robin. 5:20 PM Leaves the mountain and heads home. 9:00 AM Leaves to go the beach. 11:00 AM Standing at the end of the long pier to the left of the fish shop. 3:00 PM Leaves to go to The Stardrop Saloon. 4:30 PM Arrives at the saloon, playing at the pool table with Sam. 9:30 PM Leaves to go home. 6:00 AM At home, working on his motorcycle behind the farmhouse. Sebastian lives with his mother, Robin, along with his step-dad Demetrius and half-sister Maru. Robin sometimes calls him Sebby. He feels that Maru is treated better than he is, and during Winter will talk about building a snow-goon that Demetrius demands he removes; he will then angrily question what his step-father's problem is. Sebastian is good friends with Sam; the two can be found hanging out at Sam's house or at The Stardrop Saloon playing pool. They also stand together at festivals, along with Abigail. It is hinted he may have a crush on Abigail, after Sam tells the player Sebastian really wanted Abigail to be their drummer "for some reason". Furthermore, if married to Maru, she may sometimes say she "wishes her brother would just ask Abigail out". During the Flower Dance, if not dancing with the player, Sebastian dances with Abigail. You can give Sebastian up to two gifts per week (plus one on his birthday), which will raise or lower his friendship with you. Gifts on his birthday (Kış 10) will have 8× effect and show a unique dialogue. Enter Sebastian's room when he's there. You find Sebastian working on his computer. When he finishes, he mentions that he's a programmer and is working on a project for a client. There's a notification on his computer, and Sebastian explains that it's Sam asking to hang out, but he would rather not go out. Robin enters his room moments later, telling him that Abigail was looking for him and will stop by later. Sebastian asks whether Robin told her that he was working, and Robin says yes, but Abigail decided that she would probably stop by anyway. Robin leaves the room, and Sebastian expresses his irritation that nobody takes his job seriously. Go to The Mountain between 11am and 5pm. You see Sebastian working on a motorcycle in the garage at his house. He explains that it belongs to him and sometimes he goes for long rides alone far away from Stardew Valley. He suggests the possibility of you one day taking a ride with him, to which you agree or disagree. Go through the front door. Attack and then shield from the skeleton. Go through the left hallway glowing with a green light. Warrior: defend your friends while the wizard is mumbling an incantation. You will be able to attack the boss, and the scenario ends. Healer: heal Sebastian's wizard. Sebastian is grateful and he defeats the boss. Wizard: use shield block while the enemy is mumbling an incantation. The enemy wizard shoots a beam at Sebastian, but your shield block reflects it and hits the enemy in the face, killing it. Go to the beach on a rainy day between noon and 11pm. Sebastian is standing on the boardwalk. He's surprised to see you outside in the rain. He says he's anxious around other people, but he doesn't feel that way when he's with you. He takes out an umbrella and motions you to stand under it with him. 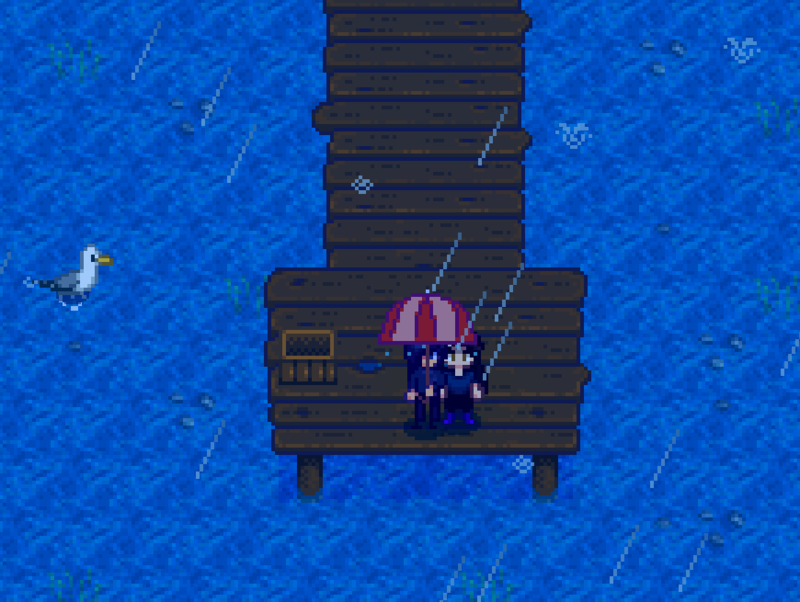 Bug: After the cutscene, the rain won't make a sound anymore until you leave the beach. Go to The Mountain between 8pm and midnight. Sebastian is outside his house. He says he was about to go for a ride on his motorcycle. 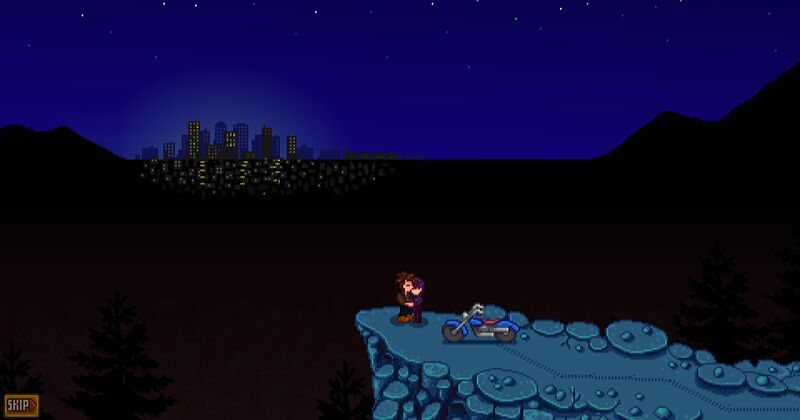 You join him for a ride, and he brings you to a place he often goes by himself to think about his life while enjoying a view of the city. If your character is female, he mentions that he doesn't normally bring girls to this place. Otherwise, he admits that he's never felt this way about other guys, but that you're different. He pulls on his cigarette a few times, and then asks what you think of the city. You have four options, one of which is telling him to quit smoking. Choosing this one causes Sebastian to be briefly annoyed; he says you sound like his mom, then admits that it's a bad habit and he'll try to stop. He confesses his true feelings for you, and you embrace under the full moon. Once married, Sebastian will move into the farmhouse. Like other marriage candidates, he will add his own room to the right of the bedroom. He'll also set up a small area behind the farmhouse for his motorcycle, and sometimes go there to work on it. On mornings when Sebastian stays inside the farmhouse all day, he may offer you Coffee. On rainy days, he may offer you a gift he found in "the caves": Obsidian, Void Essence, Bat Wing, Frozen Tear, Amethyst, or Cave Carrot. On New Years Eve (Winter 28), he'll give you a Beer to celebrate the new year. Sebastian may randomly request an item at the "Help Wanted" board outside Pierre's General Store. The reward is 3x the item's base value and 150 Friendship points. In Sebastian's bedroom there's a poster of a character that resembles a Harvest Moon protagonist. Even if you've already given Sebastian the Bouquet, and the social Tab shows him as "Boyfriend", it might occur that he asks you if you are single. On Fridays, Robin might say "I found an ashtray in Sebastian's room, and it smelled really weird. Should I be worried about this?". This could be a hint to Sebastian smoking pot in his room. Sebastian's look evolved over the years the game was in development. Here's a timeline showing how ConcernedApe's art and Sebastian's style changed over the years before the game was launched. 1.1: Added motorcycle area behind farmhouse if married. Bu sayfa son olarak 24 Mart 2019, 20:17 tarihinde güncellenmiştir.